Urban Salsa from the streets of Bogota! They have the freshness that only a young hard salsa band can have. La-33, was founded in 2002 in Bogotá (Colombia) by the two brothers Sergio and Santiago Mejia. The album debut titled "La-33", released in 2004 as an independent production, won immediate success for its arrangements, lyrics, clean recording and great sound, and specially for their worldwide Latin dance hit - "La Pantera Mambo", a mambo version of "The Pink Panther". 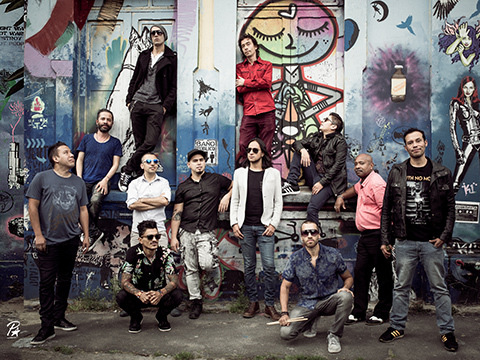 La-33 is hard-swinging salsa & Latin Jazz from Bogota for an irresistible and infectious urban salsa concert! This is clearly a band that generates excitement and does it with a sense of humor. There is no stuffiness here, and the music is totally refreshing. "I loved this storming assault of Latin brass when we reviewed, but having seen them live I'm convinced that is one of the best party bands on the planet" (Songlines).